One fact about me: I cannot fall asleep before 1:00am, despite my best efforts. It has now gotten to the point that I do not even make an effort anymore. My most productive moments occur when I am sitting in front of a glowing laptop at 3am, with jazz booming through my earphones and a cup of hot decaf coffee just at arms-reach. However, by not making this effort, I will admit that my mornings are horrendous. I have a set of alarm clocks strategically placed around my room in order to ensure that I wake up. My morning agenda then consists of pouring a cup of coffee and spending the next thirty minutes scouring the internet news and social media sites. Last week, I experienced a disruption to this ritual: the internet was down. I was completely thrown off and spent the rest of the day as if in a daze. While in a meeting, I couldn’t hold back my frustration and blurted out, “My internet is down and I haven’t even checked my emails today!” Of course, thinking back on this, I am a bit disturbed by my dependency on technology. Despite the typical American belief of celebrating modernity and technological advancements, my family placed a strong emphasis on being connected to the past. Both my father and my maternal grandfather enjoy genealogy in their spare time. Needless to say, I spent a good part of my childhood attending historical re-enactments (not as an actress – which would have been very cool), family reunions, and graveyards to find the burial grounds of my ancestors. In fact, when I was ten years old, my great-grand uncle purchased a house in western North Carolina that was in a state of disrepair. This home was built before 1790 by Jacob Shook, an American Revolution war veteran who also happens to be my direct ancestor. My family became very involved in documenting the restoration process and encouraged me to conduct my own research into the house. As it turns out, my ancestor was a strong supporter of the early Methodist movement. He dedicated the upper room of his home as a prayer chapel and shaped-note singing school. He donated a portion of his land as camp meeting grounds. Oral tradition also states that circuit rider Francis Asbury spent the night and even preached from the doorway of Jacob Shook’s home. I cherish the memories I have at the Shook House; playing in the creek in the back yard and spending time with my family. Growing up in the United States – a place which is often so separated from a sense of history – the concept of history is extremely interesting to me. While in Barcelona, I couldn’t get over the fact that I walked past Roman ruins every day. 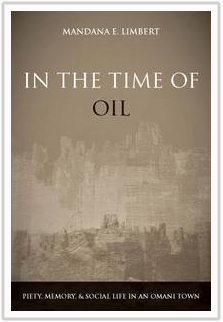 My interest in different perceptions of history caused me to choose Mandana E. Limbert’s “In the Time of Oil: Piety, Memory & Social Life in an Omani Town.” In this book, the author describes the vast changes which have recently taken place in Oman. She states that many Omanis have a difficult time believing that the present age is permanent and doubt that the many modern conveniences will last. Instead, they believe that the past circumstances of poverty will reemerge in the future. The author describes current Omani society as completely different from the past: “The coup d’etat of 1970 and the oil economy that accompanied the post-coup regime inaugurated a new era in Oman, an era of flawless asphalt roads and shiny banks with marble floors and gold doors, an era of piped water, ‘modern’ schools, and abundant coffee.” (page 165) Omanis believe that the acquisitions of these modern conveniences directly relates to the finding of oil in Oman. However, the appearance of sources stating that Oman has only 20 years of oil sources remaining contributes to the sense that wealth and the luxuries it provides should not be considered permanent. Nonetheless, the influences of modern conveniences are permeating through many aspects of Omani society, and are changing a way of life that has been established for centuries. As the author is a woman, Limbert was able to experience the Omani women’s customs and traditions, which are outlined in chapters 3 and 4. Before the discovery of oil, women were required to work together in the fields to make ends meet. By doing so, they fostered a sense of community. Now, as these women are no longer required to work, their newly-found leisure time is spent in a community. Many women in the Bahla (the town where the author lived) community congregate every morning just to talk and share morning coffee. However, many of the younger generation, including their own daughters, consider this time idle and even against the Islamic tradition. While their mothers are focused at maintaining a sense of community, the younger generation are much more private. In one part, the author describes a newly-created road dividing the town of Bahla into two parts. She states that it could be viewed as a symbol of the power of the emir – or at least the central government – over even remote areas of Oman. For those who have visited this area, do you feel as if the emir’s power is felt in such an obvious way? Why or why not? For people in Oman or from the Middle East, do you recognize a different mindset between yourself and older generations? Are there differences of opinion about topics such as community, personal space, and individuality?